An iframe, or inline frame, is a way that a page can embed another page. An iframe is not a modification of your site’s HTML. Think of it as a picture frame – it’s merely a mode of presenting a photo, but the photo itself is not altered. You will still get analytics data. The browser runs your page just like normal which includes analytics data. 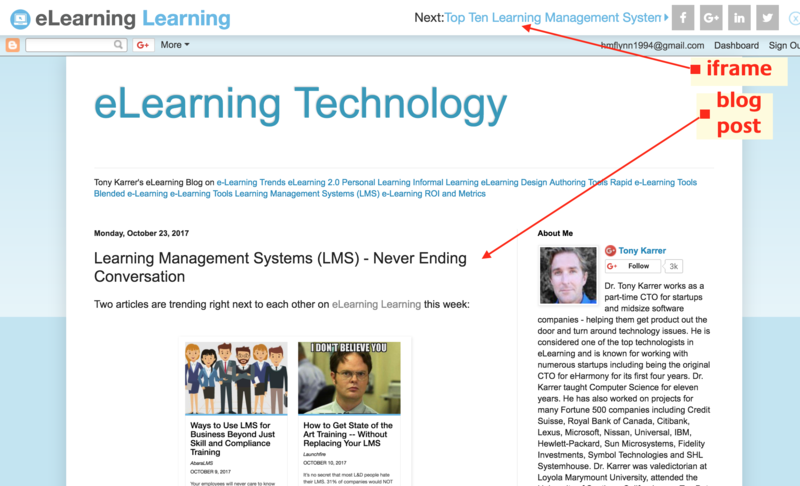 Aggregage displays most blog articles with a small header at the top and then the full contents of the article inside an iframe below. See below for an example. Your article will only show up inside of an iframe when a user is viewing it as a result of visiting our site or newsletter. In other words, this is traffic to your article that would not have happened had we not placed your content in front of our reader. Why does Aggregage use iframes? Easier sharing. Using iframes allows us to present easily-accessible share options. This makes the reader more likely to share your article on social media, giving it a bigger audience and boosting its score from our algorithm. Ability to navigate. Our readers have come from our newsletter or site and are likely to want to read more than one article. The top banner makes it possible for the reader to get to the next article and back to the site without a lot of clicks. We want it to be easy for our readers to take full advantage of the amount of thought leadership we have in one place! But isn’t it scraping my content? Will it mess with my SEO or my analytics? Nope! Again, an iframe is only a method of displaying your content, hosted on your site. It is not scraping your content, nor is it hosting your content on our site. Any visits to your site with our iframe in place will still be recorded in your analytics as traffic. Additionally, SEO is passed through from our site to yours. The iframe page has a no-index, follow directive in its meta tag. This means that Google bots and other bots skip past our page and count yours for search engine results. We also include a canonical tag to direct Google searches straight to your page. This has worked well with the thousands of blogs that make up the Aggregage community. What do I do if the Aggregage iframe is causing my page to render improperly? Or if I have other questions? Please contact us at editor@aggregage.com.